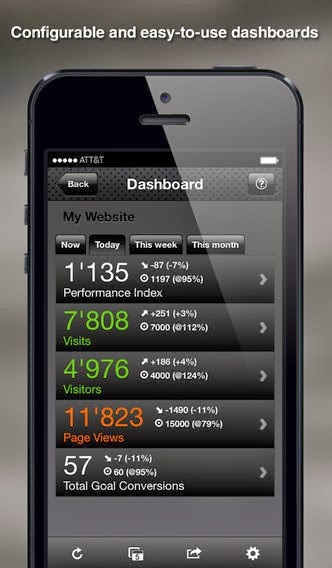 TechnologyIQ: On my iPhone...iDashboard - Monitor your Google Analytics on the go! 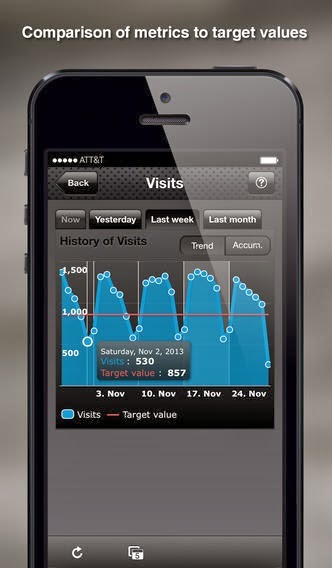 On my iPhone...iDashboard - Monitor your Google Analytics on the go! As I throw myself into blogging and other forms of New Media full time, I need to be able to monitor what is happening on my web site several times a day and I like to do it even when I am out and about in the world. iDashboard provides a great method of checking in without pulling out my laptop and firing up the Wifi. On opening, iDashboard provides 4 major stats - Performance Index (calculated by the app based on the other 3 stats), Visits, Visitors, Page Views. You can see timelines showing you past history and, in the paid version of the app, even see real time stats of who is visiting your site, right now. Tabs are also provided for weekly and monthly summary stats. If you want a lot detailed data, you'll still need to log into Google Analytics via the web, but for quick, on-the-go access to your stats, nothing could be easier. Have your Google Analytics key performance indicators always with you on your iPhone or iPad – all at one glance! Using your Google Analytics account this app shows your website’s most important metrics and conversions on one single dashboard. Dip into your website’s performance from a management point of view – any time and in real-time. The dashboard metrics will indicate in red or green whether or not you’re on track reaching your website goals, right now or all through the month.